One of the breeds of domesticated ducks is the Aylesbury duck, which was bred for its appearance and its meat. 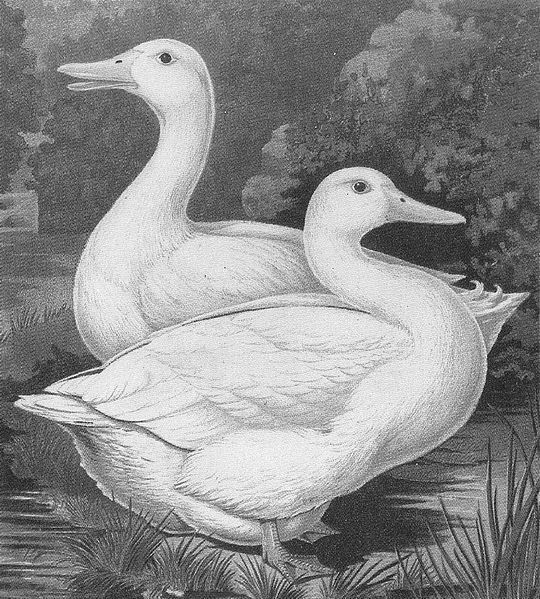 The origins of this duck is unclear, but raising white ducks became popular in Aylesbury, Buckinghamshire, England during the 18th century due to demand of the Aylesbury duck’s white feathers for quilts. During the 19th century, this selective breeding for characteristics such as shape, size, and colour led to what we know as the Aylesbury duck today. This duck was associated with Aylesbury, as duck rearing was a major industry in this town in the 19th century. These ducks were bread on farms in the countryside. Fertilised eggs were brought into Aylebury’s “Duck End”, where local residents would rear ducklings in their homes. When a railway opened in 1839 in Aylesbury to London, this enabled quick and cheap transport to London’s markets. As a result, duck rearing became rather profitable. By the 1860’s, the industry moved out of Aylesbury into surrounding villages and towns so the industry within Aylesbury declined. Another event that hampered the population and popularity of the Aylesbury duck was the Pekin duck, which was introduced into the United Kingdom in 1873. Although it had a poorer flavour than the Aylesbury duck, the Pekin duck was cheaper to raise and was more hardy. As a result, many duck breeders switched completely to the Pekin duck or created Aylesbury-Pekin duck crosses. By the start of the 20th century, the Pekin duck completely demolished the pure-bred Aylesbury strain due to inbreeding and disease. As a result, the cost of duck food increased and led to the decline of Aylesbury’s duck industry. During World War 1, Buckhinghamshire’s remaining duck industry’s small scale producers were wiped out, leaving only a few large farms to breed the Aylesbury duck. WWII once again disrupted these Aylesbury duck farms once more, and this lead to only 1 significant flock of Aylesbury ducks surviving in 1950s. However, by 1966 there were no duck breeding or rearing businesses within Aylesbury. At present, there is only 1 surviving flock of pure-bred Aylesbury ducks in the United Kingdom. In the USA, this duck is critically endangered. 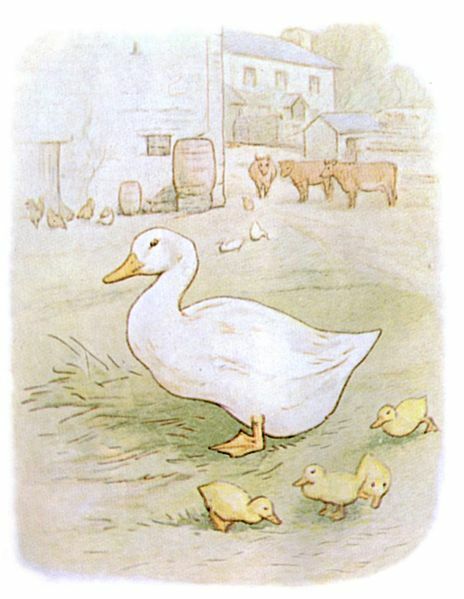 Beatrix Potter’s, “The Tale of Jemima Puddle-Duck” in 1908 was about an Aylesbury duck called Jemima. Although it was set in Cumbria, this book caused renewed interest in this duck but unfortunately, this duck was already in steep population decline. 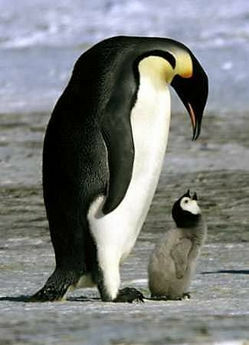 Technological improvements such as incubators were not used, so this weakened the breed. Despite its glorious past and its demise, the Aylesbury duck remains a symbol of Aylesbury town. It currently features on this town’s coat of arms, as well as the club badge of Aylesbury United F.C., which is nicknamed ‘The Ducks’. The now defunct Aylesbury Brewery Company also featured this duck on its logo, and this can still be seen at the Britannia pub. There is also a shopping area in Aylesbury called Duck Farm Court which is located in the California area. This is actually close to one of the main breeding grounds for the Aylesbury duck in town.